After gorging ourselves on bread and cheese and rose for the past 2 weeks, we’re being tastefully frugal and enjoying evening meals of soups and salads. Soups are the easiest things in the world to make and really quite satisfying in both the concocting and consuming. So being rather proud of my last 2 evenings effort, I thought I’d share them…..in the absence of a longer and more interesting post about all the things I should be writing about. They will come soon, promise. I used cooked beetroot which is much quicker and just as healthy as the raw version which needs cooking and boiling for hours. This recipe serves 2 as a main and 3 or 4 as a starter. Chop the onion finely and crush the garlic. Heat a knob of butter and a glug of olive oil in a large pan and add the onion and garlic until soft but not coloured – do I sound like a cookery book yet – only take about 5 minutes most. Add the balsamic vinegar and cook for further couple of minutes until it most is absorbed. Don’t have the heat too high for all this. Quarter the beetroot and add, cook for a couple of minutes and then cover with the chicken stock (or you can use vegetable). Cook just for 5 minutes or so, the beetroot is already cooked so it’s really just to get all the flavours mixed up together. Blend until nice and smooth and then put back in to the pan. Add the coconut milk or cream – to taste – and more stock if it’s too thick. You don’t want it too runny though. Season to taste. Allow to chill for a couple of hours. You can always put it in the freezer to speed things up a bit towards the end. Serve with a dollop of yoghurt and sprinkle some chopped greek basil (the little leaves are really good with this) and some crushed shelled pistachios and a drizzle of olive oil. Looks pretty as a picture. Soup number 2 was butternut squash – which actually followed pretty much exactly the same recipe as the beetroot but here it is anyway. 1 butternut squash – I peeled it but apparently you don’t need to. I’ve never really been sure. So, sweat the chopped onion as before and when they’re soft add the balsamic…..just as before. De-seed and peel the butternut squash and cut it in to small chunks – cooks faster that way. Cook with the onions and balsamic for a few minutes and then add the stock to cover. Simmer until the squash is soft. Blend until smooth and then return to pan and add the coconut milk and season to taste. Serve hot with a drizzle of olive oil, some chopped basil or corriander and a dollop or yoghurt if you like. And there you go. 2 soups with pretty much exactly the same ingredients but totally and utterly differently delicious. 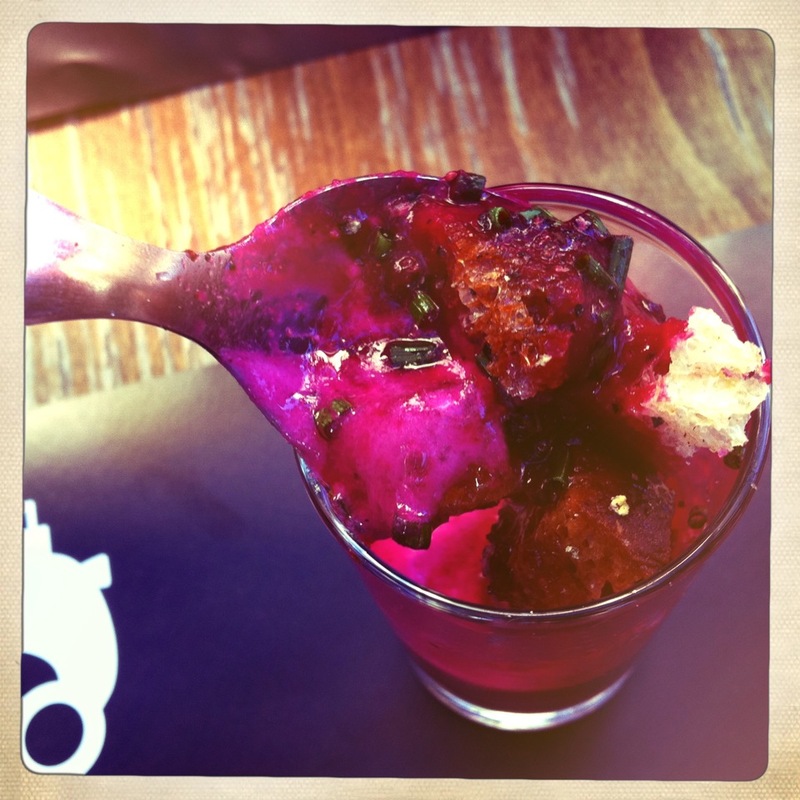 This photo was taken at the brilliant restaurant Le Tracteur where we enjoyed a fabulous beetroot soup complete with croutons and chopped chives.